Bravenet is the brainchild of a man simply called Dave, who was building a site way back in 1997 when he found that many solutions providers at the time were too limited to be of great use or too hard to implement. To satisfy his own need for decent tools and services that are interactive, fully customizable, and remotely hosted, Dave founded Bravenet and it was a huge success. Today, Bravenet continues to develop new generation web hosting services to help today’s businesses keep with the pace and grow along with the change. Bravenet does not offer any uptime guarantee to the availability of its products and services. How Much Does Bravenet Cost? Bravenet does not support cPanel due to privacy and security concerns. Each company has its own characteristics, and can need a special solution that will be designed for their company size, type of customers and staff and even specific niche they deal with. It's not wise to count on locating an ideal service that will work for every business regardless of their background is. It may be a good idea to read a few Bravenet reviews first and even then you should keep in mind what the hosting service is intended to do for your company and your staff. Do you need an easy and intuitive hosting with only elementary features? Will you really make use of the advanced functionalities required by experts and large enterprises? Are there any specific features that are especially practical for the industry you operate in? If you ask yourself these questions it will be much easier to locate a reliable service that will match your budget. We realize that when you make a decision to buy Hosting Services it’s important not only to see how experts evaluate it in their reviews, but also to find out if the real people and companies that buy it are actually satisfied with the product. That’s why we’ve created our behavior-based Customer Satisfaction Algorithm™ that gathers customer reviews, comments and Bravenet reviews across a wide range of social media sites. The data is then presented in an easy to digest form showing how many people had positive and negative experience with Bravenet. With that information at hand you should be equipped to make an informed buying decision that you won’t regret. Bravenet customer support consists of documents and wikis designed to help clients figure out the solutions to their issues without requiring to contact the company for assistance. A ticketing system manned by knowledgeable staff is also available. What are Bravenet pricing details? Webair accepts payments via credit cards (VISA, Mastercard) and PayPal. Yes, Bravenet does have a free version which includes a free domain among other things. Bravenet does not offer any uptime guarantee as well as to the availability of its products and services. Yes. 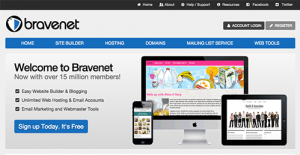 Bravenet offers unlimited emails and bandwidth with its hosting package. Yes. Bravenet subscription comes with a built-in website builder that offers simple and user-friendly tools and applications clients need to create websites from the ground up. Yes. Bravenet offers an eCommerce features such as shopping cart integrations, PayPal and eBay applications. SSL certificates are also provided with their hosting solutions. Yes. Bravenet provides support for sites built using WordPress. I have been with bravenet for many years and have several domains with them. Their service is easy to work with and I have always found them helpful when I have a problem. They respond quickly and courteously. Highly recommended. If you need more information about Bravenet or you simply have a question let us know what you need and we’ll forward your request directly to the vendor.